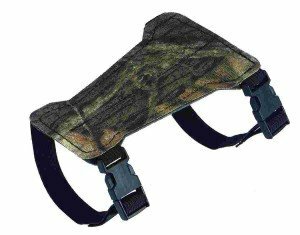 6 Best Archery Arm Guard Reviews 2018 (Updated) | Revealed by Experts! 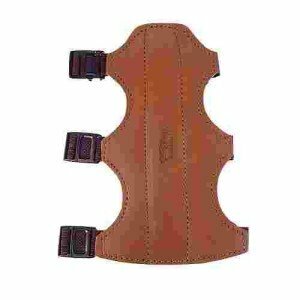 Hey dude, Are you searching for best archery arm guard? No one wants to get hurt in their arms thats why in this article, we will discuss top rated archery arm guard and review it for you, so you can make a well-informed decision when it comes time to buy. As the name would suggest, the primary purpose of an arm guard is to protect your arm from the bowstring as you release it. For many novice archers, doesn’t matter you shoot a longbow, recurve or compound, the arm guard is crucial as you are figuring out how to hold your arm and stand while shooting, among other things. Here is the list of best archery armguard available on the market today. As I mentioned, most archers prefer leather when it comes to arm guards. Personally, I also like leather, as it has more of a classic appeal and it is highly durable. The Bear Archery arm guard has two layers of leather for added protection, which makes this both sturdy and long-lasting. It is also ambidextrous, so it’s perfect for left or right-handed archers. However, there is one issue with the design, and that is the fastening. Like many leather guards, the Bear arm guard uses metal bolts on either side to hold the leather strings in place. However, the bolts themselves are not as well fastened as they should be, and can thus pop out after extended use. This is particularly the case if the bowstring catches on one of them, which can happen. Fortunately, the bolts are easily replaced, but it is a bit of an annoyance. The length of this guard is only about six inches, so for archers with long arms, the material will only cover about one-third to one-half of your forearm, so be aware of that. Otherwise, it’s a very fine piece of material, therefore, it is used as the compound bow arm guard as well. I personally feel it is good gift idea to gift someone this arm guard. When it comes to leather, there are many varieties of animal leather from which to choose. The most plentiful is cowhide, which makes it one of the most inexpensive leather options. That being said, although the Santu arm guard is less expensive than other leather arm guards archery, it still is highly effective and versatile. The Santu guard is relatively long, making it ideal for novice and moderately skilled archers. It is also ventilated down the middle, which is always a nice touch. The guard is adjustable, utilizing four vinyl straps. As far as downsides, there aren’t really any. For more advanced archers, the size may be a bit cumbersome, but otherwise, it is well built and well fastened. Additionally, because of the number of straps, it puts less strain on each strap, making it last much longer than other guards. When it comes to arm guards, there is absolutely a difference between youth and adult versions. While adult guards are built to withstand abuse and heavy wear and tear, youth-oriented guards are usually a bit less durable. This is especially true with the fastening, as the Tarantula guard is made by sportsman’s outdoor products which use plastic buckles to secure it, rather than straps or elastic. However, this is perfect for young archers, as they typically only use arm protector on the archery range, and not out in the field. 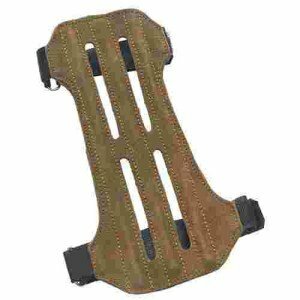 As far as protection goes, the Tarantula Youth Arm Guard is perfectly sufficient for a young shooter. However, it is only six inches long, making it ideal for children between nine and twelve years old. The straps are adjustable though for a nice, snug fit. As far as drawbacks go, the only one would be the fact that it uses plastic buckles to secure it to the arm. These can be cumbersome and annoying to some shooters, but it’s not necessarily a dealbreaker. Unlike the previous guards, the OMP Mountain Man is made of suede, not leather. This material is much cheaper, making this guard ideal for those who are looking for something on a budget. Thankfully, though, the lower cost doesn’t make for a less-effective guard. The OMP is also different from other guards in that it is not one solid piece of material. Instead, it is ventilated, allowing skin to breathe. On hot summer days, this is a welcome relief. The size of the OMP is seven inches, covering most of the forearm. The size makes it perfect for both novice and moderately skilled shooters. As far as downsides, the main issue is again the fastening. OMP uses an adjustable velcro strap. While this is better than Martin’s elastic band, the straps themselves are not thoroughly embedded in the leather. This means that, under stress, they can come out. If that happens, the guard is practically useless, as there are only two straps. However, this is not a common occurrence, so it shouldn’t be that big of an issue. 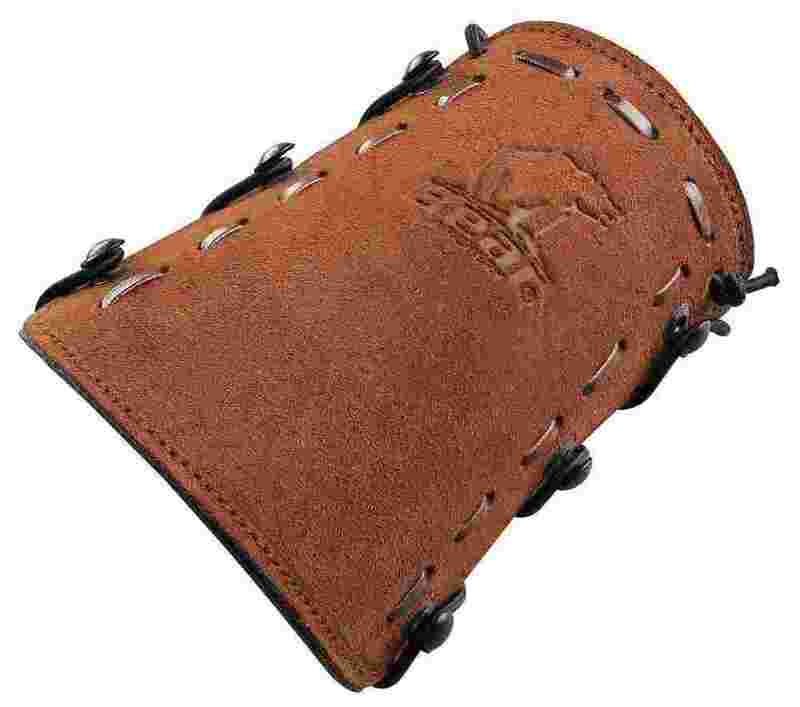 Similar to the Bear Archery arm guard, the Martin Archery guard is made almost entirely of leather. However, instead of using leather straps bound to metal bolts, the Martin guard has adjustable straps, similar to those you would find in a backpack. These straps are also elastic, which makes them great for versatility, but it does mean that they can wear down over time. When it comes to mechanics, the Martin guard is similar to the Bear guard. Both have a great, high-quality piece of leather for protection, but both fall a bit short in the fastening. Elastic straps always wear down with repeated use, and these are no different. While it’s not necessarily a deal breaker, since you can still adjust them to be tighter, it is a consideration for long-term use. Additionally, the straps themselves are not fastened to the leather as well as they should be, and can pop off under stress. With only three straps, losing one can be detrimental. Overall, however, the Bear Archery leather arm guard is great for practice shooting and recreational use. 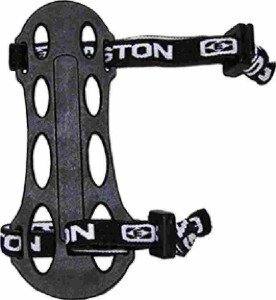 This Easton arm guard is made of composite materials, which may or may not be a good thing, depending on your preference. That being said, composite guards are more than durable enough, and will stand up to repeated abuse. What is most striking about this guard, however, is the amount of ventilation. Four large ovals on each side mean that your arm will be well ventilated while still maintaining the necessary protection. Easton uses two adjustable vinyl straps for versatility, although I would prefer if they were a solid color, to blend in with the rest of the guard. (Currently, they are black and white sporting the Easton logo). Aesthetics aside, the Flex Arm Guard is a capable device, although it is on the smaller side. While the dimensions listed say it is eight inches long, it is actually closer to six. Thus, if you have a larger arm, or are needing something longer, this guard may not be suitable for your needs. if you are using a bow and arrow in a variety of environments, from hot and cold, then your arm guard needs to be able to adapt to these conditions. Specifically, it needs to adjust to the amount of clothing you’re wearing. In winter, bulky clothes and jackets can easily get in the way of the string, so the guard needs to cover all of it as best as possible. Elastic is a good choice for this reason, but realistically a tie-up arm guard is ideal. While many arm guards are relatively cheap, you want to make sure that the material is high-quality. Most archers prefer leather due to its durability and effectiveness, but there are other materials out there, like suede and vinyl, as well as different attachments. Make sure that the guard you get can withstand punishment so you don’t have to replace it regularly. Now we get to the archery arm guard reviews. When looking at products, I chose them based on their quality and versatility, as well as whether or not they would be best for novice or expert archers. Even though the guard itself is a relatively simple device, it is necessary for your safety. With that said, here are the best archery arm guards available. 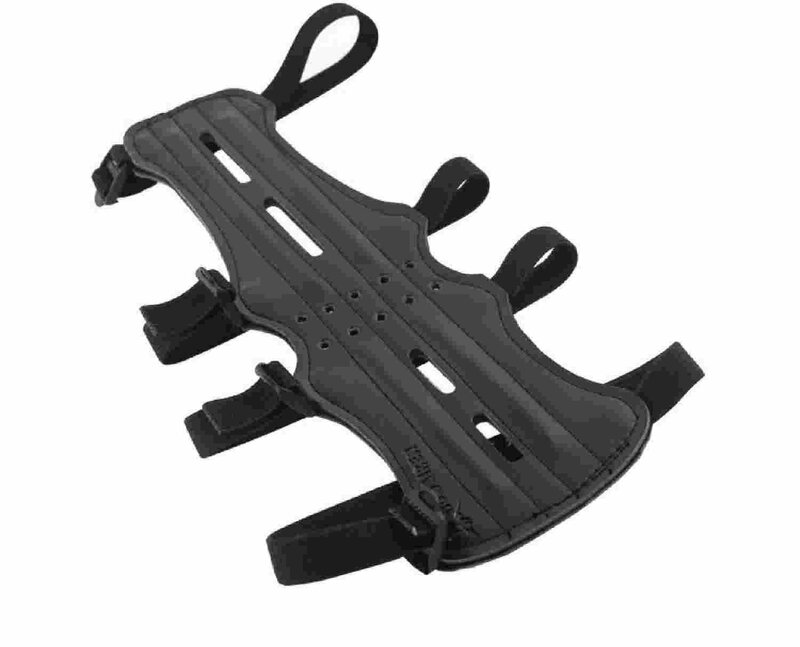 Bear Archery Armguard will meet your needs and it is best archery arm guard according to me. Most important Archery/hunting accessories you can have with your bow and arrow is the arm guard, shooting gloves, , carbon arrows, archery release etc.